Pakistan's Misbah-ul-Haq has scored the fastest 50 in Test cricket and equalled the record for quickest century. Misbah reached 50 in 21 balls on the fourth day of the second Test against Australia, eclipsing Jacques Kallis of South Africa who took 24 balls in 2005. The Pakistan captain went on to match the 56-ball century mark set by West Indies legend Viv Richards in 1986. Pakistan declared on 293-3 after Azhar Ali reached his ton, setting Australia 603 for victory in Abu Dhabi. 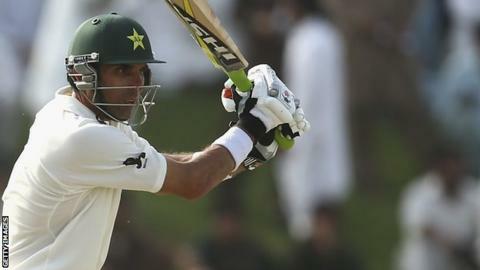 "It's a great feeling to be named alongside Viv Richards, it's amazing," 40-year-old Misbah told BBC World Service. "He is one of the best batsman world cricket has ever produced. It's a wonderful thing for me. "I was looking at the screen when I got to the fastest 50. Someone came out from the team when I was on 85 and said you have 10 more balls to get 15 runs to get the record. I tried it and I got it." Misbah hit Steve Smith for four sixes, three in one over, as he raced to 50 in just 23 minutes. The Pakistan batsman was dropped by Peter Siddle off Smith's bowling when on four, before going on to hit 38 runs from the 11 balls he faced from the part-time spinner. He continued his scoring rate after lunch, hitting successive boundaries off Mitchell Starc to equal the century record set by Richards against England in Antigua and score his second ton of the match. Azhar scored his century from 174 deliveries, to also register his second hundred of the game. It is only the second time that two team-mates have scored centuries in both innings of a Test match after Australian brothers Ian and Greg Chappell achieved the feat against New Zealand in 1974. Pakistan, who resumed on 61-2, lost Younus Khan in the morning session, trapped leg before wicket by Smith for 46. Younus, who hit a double century in the first innings to follow two centuries in the first Test, finishes the two-match series with a total of 468 runs. Australia reached 143-4 in their mammoth second innings chase, having lost Chris Rogers, David Warner, Glenn Maxwell and skipper Michael Clarke. Clarke's side need to bat out the fifth day or score the 460 runs still required for victory. The highest successful fourth-innings chase is 418 by the West Indies against Australia in 2003. Pakistan need to win or draw the Test to record their first series victory over Australia since 1994.